Most people find it hard to manage their money and we continuously hear from clients “I don’t know where all the money goes!”. People try to write a budget, but having a budget sitting in a drawer somewhere will not help you achieve your goals. For this reason we have developed a complete program to help you succeed at your money management without endlessly sorting through bank statements. The program utilises latest software technology, a bank account structure that works for you and not the bank and one on one coaching based on proven techniques and psychological research. Track your spending to your budget to see your progress and identify issues before they become financial problems. Keep you accountable to your commitments and goals to help you achieve success. Give you accurate information to base important financial decisions on and someone impartial to discuss them with. Simplify your life by providing fully reconciled reports of your bank accounts, budgets and financial matters. Give you a Bank account structure that makes sense and helps you think about your money correctly. Help you have better conversations around money and reduce arguments! Create good money habits and help you take control of your finances. Benchmark your progress against your previous results and other clients in a similar position to you. Take the worry out of money! You will know exactly where your money is going, have money set aside to cover your fixed costs and achieve your goals and have people who understand your financial situation better than you to discuss questions and concerns. Our team conducts a complete reconciliation of your bank accounts each week (with only a little input from you on those obscure purchases!). A great way to check for bank errors or identify fraudulent activity. We then provide you with Weekly snapshots & alerts during the month to help keep you on track. Monthly Reports outlining your Bank account and debt progress, your Income and Expenditure and your Budget Variance will allow you to keep track of how you are going, but more importantly how you can better achieve your goals. Your Adviser will then discuss your progress with you to see if anything needs to be addressed. Quarterly Coaching involves reviewing your progress over the 3 months and discussing areas of concern, help you get back on track if there have been issues, make adjustments to your Budget to more accurately reflect your situation and work out what to do with excess savings when things are going well. This is an important part of keeping on track and ensuring maximum results are achieved long term. Benchmarking allows us to compare your scenario to other people like you to analyse saving and spending habits, cost of living etc and help you make decisions about your situation. 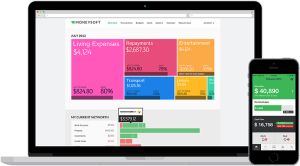 Once we have accurate spending and income data, we are able to provide you with accurate analysis of changes to your situation to help you make better financial decisions.